CPS Camp No. 69, Cleveland State Hospital, Cleveland, Ohio. Civilian Public Service workers circa 1945. 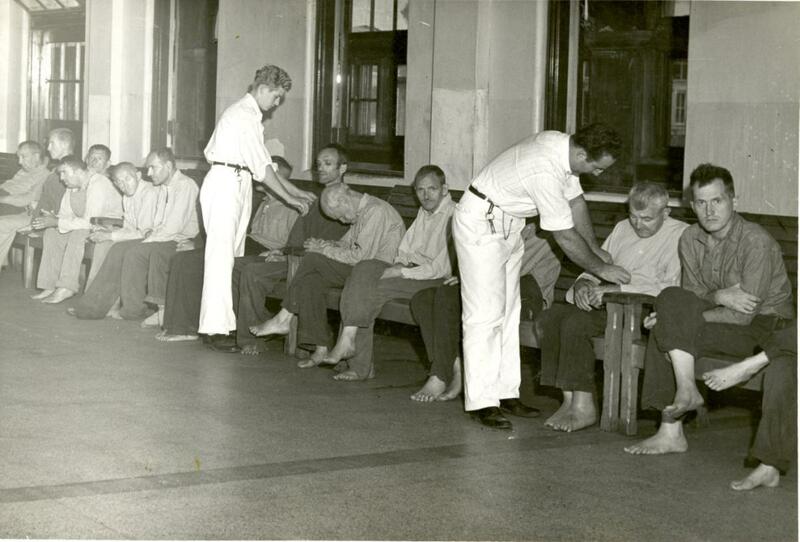 Conscientious objectors (in white) attend top patients at the mental hospital, circa 1945. 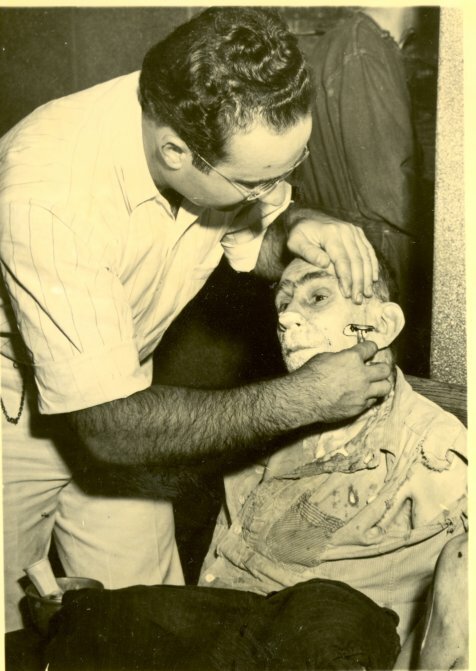 Cleveland State Mental Hospital attendant with patient. 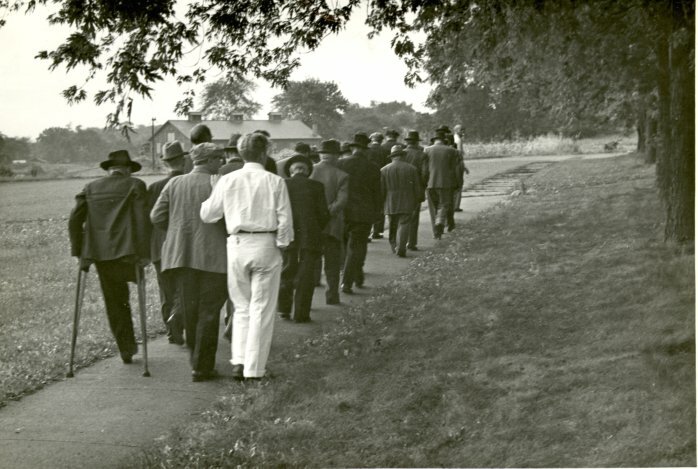 Conscientious objector accompanies mental patients on their walk on the grounds at Cleveland State (Mental) Hospital, Cleveland, Ohio, 1945-1946. Page from "SCUPPS." June 27, 1946. Letter from Vernon Rocke to Harmon Wilkinson, February 1946. Excerpts from William Ryan's daily log, 1946. "My Experience at C.P.S. #69," by Cephas Troyer. Letter from Pete Goertzen to Erwin Goering, April 1945. Letter from Erwin Goering to Pete Goertzen, April 1945. Pages from "One Out of Twenty-Two"
CPS Unit No. 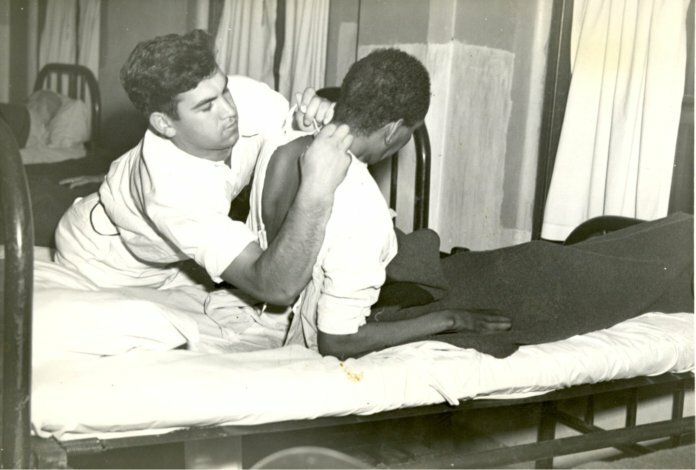 69, a Mental Hospital unit at Cleveland State Hospital in Cleveland, Ohio was operated by the American Friends Service Committee (AFSC) from December 1942 through November 1943, when AFSC and Selective Service mutually agreed to close the unit after an exposé of conditions at the hospital. Mennonite Central Committee reopened the unit in April 1945 and it closed in October 1946. The majority of the men served as ward attendants. The hospital had been built in 1855, with many buildings in the complex from the 1800s generally old and rundown. In 1945 the hospital cared for twenty-eight hundred patients, six hundred over capacity. The hospital had a poor reputation with respect to patient care. Workers had to fight cockroaches and filth in overcrowded wards, and attendants controlled patients by shouting and beatings. The “incontinent and violent” wards lacked sufficient supplies or activities for patients and experienced reports of injuries to patients and employees. Men in AFSC camps tended to report diversity in religious affiliation when entering CPS, including a variety of mainstream denominations, Jews, Jehovah’s Witnesses, as well as religious non-affiliation. Those who identified as Friends, believed in following “the Inner Light”, the experience of God present in all human beings, which revealed itself in matters of conscience. During the period of the Mennonite Central Committee CPS unit, forty-five men served at the hospital. The majority on entry into CPS reported various Mennonite and Amish denominational affiliations. Several were married and some of the wives worked at the hospital full time, others part time. Unlike the men, the women were paid for their work as they were not subject to Selective Service regulations. In 1945, eighteen women in a summer service unit worked in a women’s infirmary at Pellows Cottage. The 1946 summer service unit attracted twenty-two women. Thirty of forty-five men served as ward attendants. Ward attendant jobs, primarily custodial, were to keep the wards clean and orderly and the patients from injuring themselves or others. Some worked as cooks, lab technicians, therapists, social workers, maintenance, or in other roles as assigned in the hospital. The American Friends Service Committee unit faced not only run down and unclean facilities, but also regular employees who beat patients as a means to control them. After the Cleveland Press exposed “brutality, malnutrition and lack of proper treatment”, followed by an investigation, the superintendent demanded the release of eight CPS men, two of whom had brought charges against a regular employee for brutal treatment of a patient. As mutual distrust heightened between the hospital administration and the CPS unit, the American Friends Service Committee determined it best to withdraw the unit. Assignees lived at the hospital in staff residence units. Married men whose wives also worked at the hospital lived in a separate area. The AFSC unit faced difficulty with Superintendent Hans P. Lee early on. While the COs had been given “an attractive picture of work” at the hospital, arrangements proved different. Men had to be in nightly by “an as-yet-undefined bedtime”. They received no instruction prior to beginning work in the wards, and were denied sick time until they had completed six months at the hospital. Dr. Lee delegated supervision of the unit to employees hostile to COs. By March 1943, two COs had been given “severe workhouse sentences and fines” and dismissed from service for violating a “blackout ordinance”. Dr. Lee refused the request from Assistant Director Leonard Bullen to reconsider the harsh treatment. Robert Cox, from the AFSC base camp No. 46 at Big Flats, New York and Willard Hetzel replaced the two men. Cox was assigned to Ward B, the violent ward. Aware of the problems prior to his arrival, he learned the basis of employee distrust of the CPS unit. COs reported each case of maltreatment suffered, as instructed in the Department of Welfare’s instruction booklet. However, the administration response was to move the COs to other work at the hospital. Cox also reported incidents, and on two occasions held lengthy discussions with the chief male supervisor Leslie Mugford, only to be told that he was aware, but could do nothing because he could not find employees to replace the abusers. Other COs reported abuses directly to Dr. Lee, but he did nothing. He also retained a “hot-tempered” CO unsuitable for hospital work. The CO recognized this and had asked on two occasions to return back to base camp. Dr. Lee denied the requests. Eventually, COs talked with Rev. Dr. Dores R. Sharpe, Executive director of the Cleveland Baptist Association and Walter Lerch, a reporter for the Cleveland Press. The first of a series of articles, features, and editorials condemning abuses at the hospital appeared in October 1943. Shortly after the first stories, Herbert Mooney, the state welfare director announced he would investigate charges. On October 30, a Cleveland Press editorial called for an independent investigation. The three hundred-member Cleveland Ministerial Association endorsed an investigation by a committee of persons unrelated to the control of state hospitals. In early November a municipal court issued a warrant for the arrest of Attendant Hayden Blake. COs had reported him to administration for abusing patients on three occasions. The arrest came after a complaint was filed and supported by sworn affidavits from the son of a sixty-year-old partially blind patient whom Blake had allegedly beaten and kicked. After all this, state welfare director Mooney and Dr. Lee responded to the complaints. Mooney stated that the stories on the mental hospital were “gross exaggerations” from unreliable sources. He acknowledged beatings but excused them because of staff shortages due to the war. On November 10, Dr. Lee moved to immediately dismiss COs who “make trouble”, including two prepared to testify against the fugitive attendant Hayden Blake. The Cleveland Press editorial the following day called for the removal of Dr. Lee as superintendent. Dr. George Stevenson, medical director of the National Committee for Mental Hygiene, in Cleveland for a meeting, told the paper he found the COs to be the most reliable employees at the hospital. Lee then asked Selective Service to close the CPS unit and both AFSC and Selective Service agreed. AFSC stated that mutual distrust made the decision advisable. The unit closed November 30, 1943. Bob Cox and Will Hetzel were transferred to mental health CPS Unit No. 49 Byberry, in Philadelphia, Pennsylvania while others moved to Middletown State Hospital CPS Unit No. 81 and elsewhere. Justin Reese, sent back to the CPS base camp No. 108 at Gatlinburg, Tennessee, wondered if he was being blacklisted for his role in the exposé of Cleveland State Hospital. Reese began work on a report of the COs’ observations at the state hospital, writing to other COs to gather additional information. Both Bob Cox and his wife Martha, who worked in a woman’s ward, sent narratives. Reese completed the five- page report in early March. It included a three page attachment “Resume of Attendants’ Activities”. The first part reported abuse incidents, including those that resulted in patient deaths. Then it reviewed lack of treatment for patients, the deteriorated physical plant and other poor conditions. He sent the report to Sharpe, who passed it on to the chairman of the governor’s special committee and welfare director Mooney. The Cleveland Press headline “Church Leader Cites Brutality to Mentally Ill: Dr. Sharpe’s Report Says State Hospital Conditions Worse”, and the editorial called for a full investigation. A week later, Sharpe released a second report (thirteen pages and written by CO Donald Knoke) on food and food handling at the hospital. The Cleveland Press headlined the article, “Claims Mentally Ill Undernourished: Charges Filed by Church Federation President”. Reese continued to work with Sharpe on the ongoing investigations and exposés, and was soon hired by the National Committee for Mental Hygiene. Dr. Lee held on as superintendent until July 1944 when he resigned, asking to be appointed to a medical or psychiatric position elsewhere in the state. Staff physician Luisa Kerschbaumer also resigned, taking a position in St. Louis. She leveled charges at Lee over her difficulty in securing medications and sterilized medical supplies, severe staff shortages, as well as threats made to her if she made public comments. Before leaving, she gave testimony to Hal Griswold, chair of the state hospital committee. Lee was replaced by Dr. E. H. Crawfis, who had worked at Lima State Hospital for the Criminally Insane which had hosted a Mennonite Central Committee CPS mental hospital unit No. 71. Dr. Frank Tallman, recruited from Michigan as a reformer, assumed the new post Commissioner of Mental Diseases for Ohio on August 1. On November 20, 1944, Hal Griswold submitted the 54-page Report of the Governor’s Committee on the Mental Health Program in Ohio to Governor Bricker. The report did not address abuses at Cleveland State Hospital but did contain far-reaching recommendations for Ohio’s mental health system. recommended the retirement of male supervisor Leslie Mugford as well as other staff. Both Tallman and Crawfis were committed to reform. When the MCC unit opened at Cleveland State Hospital in April 1945, Paul Goering, who had been assistant director at Howard, Rhode Island CPS mental health unit No. 85, was selected to be assistant director for the CPS unit. that “Cleveland is a good test of our services”. All assignees on arrival participated in ward training in groups, received orientation to the hospital, and heard lectures on mental illness followed by discussions and clinical demonstrations. Later, as single replacements entered the unit, Vernon Rocke, one of the CPS men, directed individualized training. Even though Crawfis met with regular employees prior to the opening of the unit, tensions remained high between them and the second group of COs who felt the hostility. Regular employees, who experienced one hundred percent turnover every ten months, were still observed beating patients with a strap or bare hands. Crawfis assigned the CPS men to the Male Infirmary with a CO supervisor in charge. They were responsible for the care of three hundred and sixty-five “infirm and untidy” patients. Before the end of the unit, COs were spread throughout the institution to minimize disruptions to any single building. When COs complained to Crawfis about the quality of the patient food, a CO was assigned to the kitchen over protests from the dietician who promptly resigned. The women working in the women’s ward also filed reports citing patient abuse and neglect. and to share in the thinking and experience of conscientious objectors under Civilian Public Service. Luella Smith, registrar from Bethel College in Kansas led the Summer Service program, which provided an orientation course, a social work course taught by Smith and a series of psychiatry lectures by Dr. Crawfis. Emma Rohrer led the 1946 summer service unit with Esko Loewen as educational director. Hospital staff gave a course in abnormal psychology for the summer unit. (Gingerich p 225). Mary Eleanor Bender wrote of her experience in the unit. The lion’s mouth into which I jumped in 1946 was the ward of about 60 of Cleveland State’s sickest female patients, a ward featured in Life magazine’s exposé as a “snakepit for the mentally ill: Pello Second Floor.” Our patients still sit rigidly on their wooded benches in picture books as examples of their terrible conditions in the hospitals. Our day began in the hall outside the ward. As a preliminary we took deep nasal breaths to desensitize our noses against the smell of urine and feces that would hit us when we opened the door. Then came mopping and scrubbing, followed by showering of the patients without the use of big straw brooms on sore, filthy bodies as was done by some nurses and other attendants—all done with the most love and patience we could muster under the circumstances . . .
From my present day vantage point I wonder that we participated in such a system rather than protest against it. The reason: we were not equipped to protest. But after work hours we did send out mailings from the governor’s office and spoke about the need for community health centers. And finally we testified at legal proceedings. Most important we exposed what was going on. Goering and the COs were confident in Crawfis’s efforts to reform the hospital, but Goering failed to keep Rev. Dr. Sharpe informed of conditions at the hospital. Sharpe complained directly to the Mennonite Central Committee (MCC). Crawfis had wanted an MCC unit since Mennonites were more inclined than other COs to work through official lines of authority. Goering realized his error in not recognizing that Dr. Sharpe was so invested in bringing about change in the hospital that he expected to be informed. Sharpe, president of the newly reformed Ohio Mental Health Association, was honored at a luncheon on June 6, 1946 for his efforts in reforming Ohio’s mental hospitals. In his response to the testimonials, he emphasized that the real testimony from aroused citizens required the continued focus on the problems in mental health. Further, he stated that due credit needed to be given to the CPS unit serving as attendants in 1943 and responsible for bringing out the authentic information (reported in SCUPPS, No. 1, June 7, 1946 p. 2). 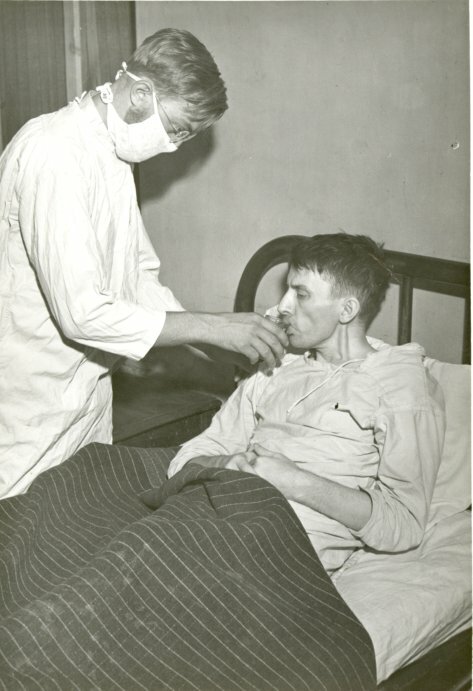 Those earlier attendants at Cleveland State Hospital were recognized in the citation of the 1946 Lasker Award as “those who protested the outrageous treatment of patients at the institution”. Dr. Dores R. Sharpe of the Cleveland Baptist Association and Walter Lerch reporter for the Cleveland Press received the awards. 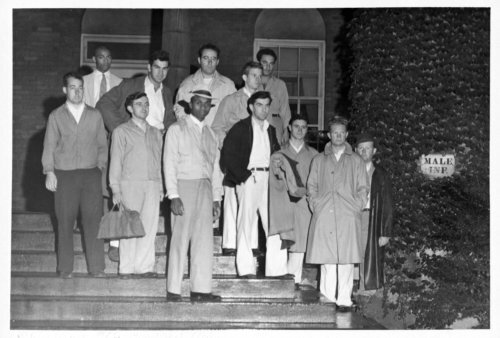 (Taylor, p. 305) Nine members of the MCC unit attended the luncheon. In the spring of 1946, Albert Deutsch and Albert Maisel published scathing exposés of state mental hospitals in PM newspaper and Life magazine (see article: Bedlam 1946), with information provided by the Mental Hygiene Program of CPS. Deutsch, in his “Shame of the States Series”, did publish an exposé of Cleveland State Hospital. He also expressed his favorable impression of the “frank and earnest” thirty-five year-old Crawfis, who expressed how much work needed to be done to give the patients adequate medical care. He also reported that Dr. Frank Tallman had resigned as Ohio’s State Mental Hygiene Commissioner in despair, for lack of the ability to bring about fundamental reforms in the state hospital system. The CPS men and women from the Summer Service Internship group published two issues of a newsletter SCUPSS in 1946. The newssheet announced weekly activities, a calendar, and included short reports of events. Unit committees included both unit men and summer service women. For more information on this unit and other mental health and training school units, see Melvin Gingerich, Service for Peace: A History of Mennonite Civilian Public Service. Akron, PA: Mennonite Central Committee printed by Herald Press, Scottdale, PA 1949, Chapter XVI, pp. 213-251. See Albert Q. Maisel, “Bedlam 1946: Most U.S. Mental Hospitals are a Shame and a Disgrace,” Life 6 May 1946, 102-118. SCUPPS, No.1 (June 7, 1946); No. 2 (June 14, 1946) in the Swarthmore College Peace Collection, American Friends Service Committee: Civilian Public Service Records (DG002), Section 3, Box 14. For more in depth treatment of the mental health units and training schools, see Steven J. Taylor, Acts of Conscience: World War II, Mental Institutions, and Religious Objectors. Syracuse, NY: Syracuse University Press, 2009.